You are already on the way to making a life changing decision by choosing a conservatory. Space - usable for a variety of activities - and natural light a plenty, to banish those winter blues! Do you stick to conventional conservatory colours/finishes or do you choose something different? Carefully chosen colours creates a space that works best for you and your home. Colour - applied correctly - has a profound positive effect on your wellbeing. It strongly influences how we interact with each other and our surroundings. We believe in offering our customers value for money when it comes to choosing their ideal conservatory roof. That’s why, when you visit your nearest retailer, you’ll be presented with a range of features designed to help you customise your conservatory roof to suit the needs of your home improvement project. Your conservatory roof will be a valuable investment. Colour plays an important part in the decision-making process when building a product from the ground up. Your approved Ultra Installer will be able to introduce to you to a range of refreshing colours, masonry and material options to ensure your new roof is built to spec. Choosing the right colour for your new conservatory roof will be of great significance if you happen to live in an area that’s subject to planning restrictions. If your home is located in a conservation area or national park, you’ll be able to discuss a suitable scheme with your approved Ultra Installer to ensure your roof is compliant. Every effort is made to ensure gloss levels are within reasonable tolerance. RAL and BS colour references are made in good faith. The colours above are reproduced as accurately as image will allow, if in doubt always request an actual physical sample/foil swatch. The foil laminated products used on major items in the roof and on the PVC side frames, have a real woodgrain texture to add a further dose of character. As the UK’s leading manufacturer of conservatory roof solutions, Ultraframe offers its Classic Roof system in a choice of colours and foils to further enhance its aesthetic range and provide its customers with lots of exciting choices. The Ultraframe Classic conservatory roof is usually foil wrapped. It includes a range of components - such as ridge bodies, fascia cladding and box guttering – that work with the foil wrapping to provide a durable paint finish. The foil laminated products that are used in each conservatory roof and PVC side frames use a woodgrain texture that adds character. The products can be coloured one side, both sides, or on the outside and the inside. The Classic conservatory roof is available in five coloured foils and four woodgrain finishes, including white. The colours will help you to achieve a completed design that will differentiate your home from others in your area. 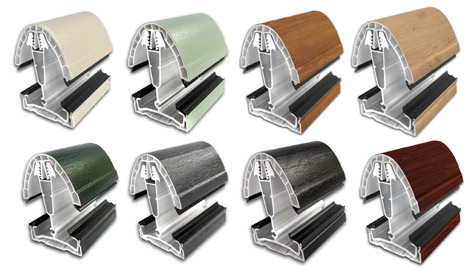 Matching PVC side frames in the same foil colours will be available to you when customising your new conservatory roof, and your installer will be able to request these products almost as quickly as with a standard roof. Looking for an Aluminium Conservatory Roof? Further enhancing the proven technology used in Ultraframe’s Classic roof, the new Ultraframe Classic aluminium suite provides a strong, rigid yet lightweight system that can be configured into virtually any roof conservatory roof design. The range features aluminium glazing bar top caps, an aluminium ridge body and cast ridge end, low profile cresting, integral brush and weathering flashing. You can also add a traditional cresting and ball finial to your conservatory roof. The Ultraframe Classic conservatory roof also includes Cornice – a decorative fascia designed to hide the PVC gutter and give the conservatory an enhanced appearance – other systems on the market make do with a PVC gutter. Further enhancements to Cornice have been introduced and are a die-cast 135 and 90-degree corner cover, which will help fitters achieve a consistent fit and finish at critical junctions to further streamline the installation process. The Ultraframe Classic aluminium conservatory roof will help you to enhance the look and feel of your conservatory. Choose from a beautiful portfolio of gloss, satin, matt and metal flake finishes that will suit your tastes. The Classic can be installed in a foiled PVC or full aluminium format. Whichever design you choose, the installation of your new conservatory roof will be hassle-free and reward you with a unique design that’s built to last. Your premium quality conservatory roof will add value in every possible way – visually, practically and performatively. Start your home improvement journey now by finding and contacting your nearest installer. Finding a conservatory roof that is tailored to your requirements – and which will add visual and market value to your home, whatever its shape, size or schemes – will be hassle-free and enjoyable when you choose an Ultra Installer to complete the work. The quality of each conservatory roof we build is matched in equal measure by the strength of our nationwide network of experienced installers. You’ll benefit from a fast, efficient and personal level of service when you use our free search tool to find a trustworthy Ultra Installer in your immediate area. It only takes a minute to find a company near you. And, if you would like to talk to a member of the Ultraframe team directly, you can also fill out a form asking for information about our range of conservatories, orangeries and replacement roofs, in which case we’ll call you for a more detailed discussion.